The different levels of power of the Herd Effect, with the effect being the most powerful on the leftmost screenshot, with descending power to the right. 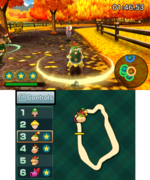 The Herd Effect is a phenomenon and a game mechanic in the horse racing sport of Mario Sports Superstars. When horses travel in a pack, a circle representing the power of the effect appears around the player. When this occurs, the stamina of the horse replenishes more quickly, as well as all horses traveling faster than horses who are by themselves. 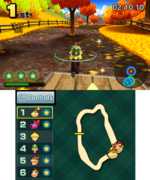 The power of the Herd Effect is represented by three levels of circles around the players, with yellow being the strongest, green being the middle, and blue being the weakest. 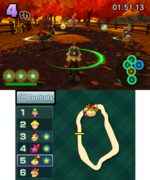 Players can find nearby players on the small radar on the bottom left portion of the screen as well, with colored rings around the player also indicating whether the player is affected by the Herd Effect. This page was last edited on February 12, 2018, at 22:42.